Álvarez has been released from prison. A sliver of my optimism that Cuba one day will be free, comes from knowing that there have been many in the machinery of the Castro dictatorship who, at risk of great peril, have examined — or perhaps discovered — their consciences, rejected the regime and taken up the banner of freedom. Whatever their motives or the nature of their conversion, they stand as credible witnesses to the evil of tyranny. Which is why, like Julio César Álvarez López, so many of them are now in jail. Not much is available online about Álvarez, now 38, or his imprisonment. Payo Libre reports that he suffers from hypertension, a common ailment in Cuban prisons. How difficult would it be for a 23-year-old young man to choose between the forces of good and evil. Even though ... he's not a Christian. He would make a decison, perhaps without full consciousness of its repercusions. At such young age, everything looks simpler, and you only think clearly behind the dark and pestilent bars of a prison cell. It was then when Julio Cesar ALvarez Lopez, ex-officer of the Cuban counterintelligence, reaffirms having done the right thing: ending his double morality, and bring(ing) a clean and honest being into light, joining those who are his true brothers, those who want the democratization of their country in a paceful manner. Julio Cesar is in front of the military tribunal, stripped of his rank. Julio Cesar. His executioners, pardon, judges are accompanied by hate. He furtively glances at his mother, who is crying, but he has chosen. He does not want to hear the screams of the prosecutor, calling him traitor. He is not. He will never betray his country. He stands firm, his head high. The members of the tribunal stand, and he is ordered to do the same. "You have been sentenced to 19 years of incarceration for insubordination and revealing secrets, according to statute 332 of 1992." Almost immediately, this courageous man with the dignity of a giant, was transferred to Kilo 8. 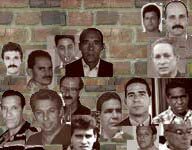 In there, in that prison, known to all in the Cuban opposition as the most cruel and inhumane, Julio Cesar faces daily all the habitual psychological pressures inflicted on every political prisoner. "Listen, Julito, are you going out to proclaim the revolutionary slogans?" "Of course not. That's why I am here."